Most of blogger need to change in blogger template but it is very important to know that how to backup/restore your template first before editing template because if you changes in coding and something wrong with your edits then you can immediately restore your old code. 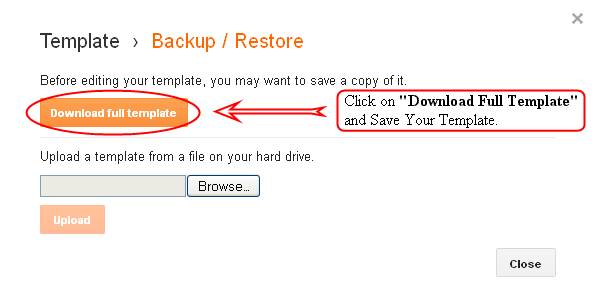 Blogger provides you easily to backup and restore your template. We provide you how to Backup and restore your template in this tutorial. 1. Go to your Blogger dashboard and click on Template. 2. Click on the Back/Restore Button. 3. Now click on Download Full Template as show in below figure. 4. Now choose where you want to save your template file on your computer and save it. Now we provide you how to restore your template if you have face any problems in editing of your blogger template. 3. Click on Browse button and find your template xml file on your computer. 4. Click on the Upload button as show in figure. It’s very simple to backup and restore your blogger template to avoid problems when you editing your template.